The church was growing. The threat of persecution could not stop it (Acts 4). The threat of corruption could not stop it (Acts 5). But the enemy still had another trick up his sleeve: internal division. What would the apostles do as this plan was carried out? This statement succinctly summarizes the job description for pastoral ministry: prayer and the ministry of the word. The apostles were devoted to prayer. It was their duty to pray. Prayer was not what they did as they led the church. It was essential to their leadership. They had no dichotomy that separated work and prayer. Prayer was their work! This is what the church needs today. First, spiritual leaders must be devoted to private prayer. Communion with God in prayer should characterize our lives. It has been well said that what a minister is in his prayer closet before God alone is what he is—nothing more, nothing less. This is why the devil would have leaders do a hundred different wonderful things if he can stop them from praying. Spiritual leaders can only minister effectively when we pray consistently. Spiritual leaders can only minister effectively when we pray consistently. Furthermore, spiritual leaders must be devoted to public prayer. The proclamation of the word is the most public thing that pastors do. But Acts 6:5 places prayer right alongside of the ministry of the word. It indicates that spiritual leaders are to be just as committed to leading the church to pray as we are in leading the church in the ministry of the word. The act of leading your congregation in prayer is a teaching opportunity we dare not approach negligently. We should do our best to prepare ourselves to lead the saints in corporate prayer. Acts 6:1-7 is often considered the institution of deacons in the church. But the word “deacon” is not used in this text. Its related term “ministry” is used. But it does not apply to the office of deacons. And it is not used to describe the seven men selected to wait tables. It is used to describe the work of the apostles’ devotion to “the ministry of the word” (verse 4). Every Christian is a minister of Christ. But pastoral leaders have a unique calling. We serve Christ as ministers of the word. We are servants of the word. Some people think pastor-teachers do very little work. They think we play golf all week and get up when its time to preach and let it rip. But those who do that are not true men of God. Indeed, some men make their pulpit work look so easy that you would think that it did not cost them any effort. But they have to work hard to make it look easy. The faithful ministry of the word requires preparation as well as proclamation. Really, the proclamation is the easy part. It’s the fun part. The burden is in the preparation. Bible exposition does not grow on trees. God does not speak to preachers and supernaturally give them the exegesis of the text. Clear, faithful and consistent preaching and teaching is usually 90 percent perspiration and 10 percent inspiration. You do all you can do and then God does what you cannot do. Paul instructs, “Do your best to present yourself to God as one approved, a worker who has no need to be ashamed, rightly handling the word of truth” (2 Timothy 2:15). 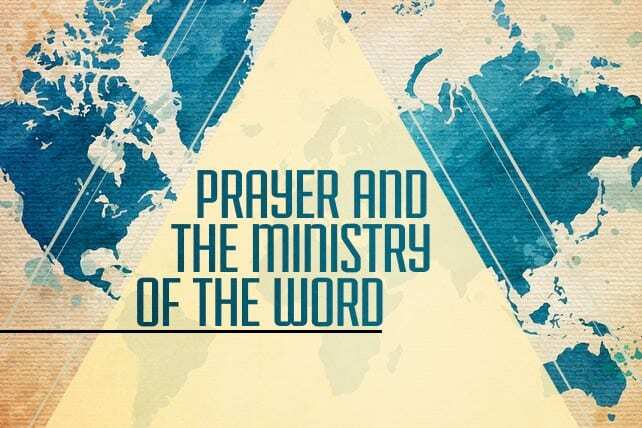 What do you do to guard prayer and the ministry of the word in your life and ministry? Next articleTo Whom Exactly Is Your Church Advertising?